This example illustrates the use of an informative prior. Hazard ratios, which are transformations of the regression parameters, are useful for interpreting survival models. This example also demonstrates the use of the HAZARDRATIO statement to obtain customized hazard ratios. Consider the VALung data set in Example 64.3. In this example, the Cox model is used for the Bayesian analysis. The parameters are the coefficients of the continuous explanatory variables (Kps, Duration, and Age) and the coefficients of the design variables for the categorical explanatory variables (Prior, Cell, and Therapy). You use the CLASS statement in PROC PHREG to specify the categorical variables and their reference levels. Using the default reference parameterization, the design variables for the categorical variables are Prioryes (for Prior with Prior=’no’ as reference), Celladeno, Cellsmall, Cellsquamous (for Cell with Cell=’large’ as reference), and Therapytest (for Therapy=’standard’ as reference). Note that a normal prior distribution with mean –0.0320 and standard deviation 0.0186 indicates that you believe, before looking at the data, that a decrease of 20 points in the Karnofsky index will probably change the hazard rate by 0.9-fold to 4-fold. This does not rule out the possibility that the Kps coefficient can take a more extreme value such as –5, but the probability of having such extreme values is very small. In the following BAYES statement, COEFFPRIOR=NORMAL(INPUT=Prior) specifies the normal prior distribution for the regression coefficients with details contained in the data set Prior. Summary statistics of the posterior distribution are produced by default. 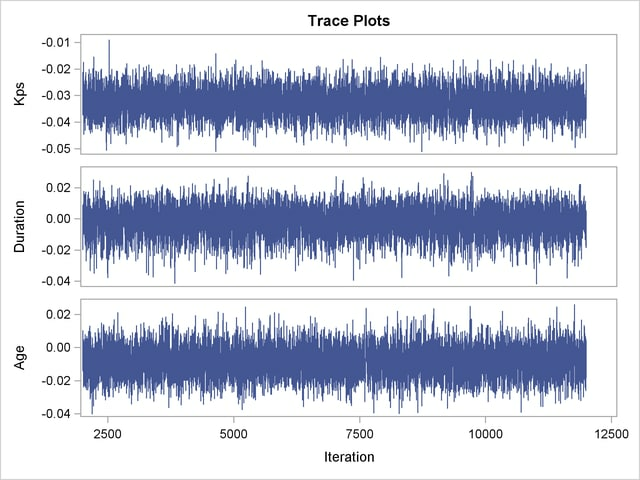 Autocorrelations and effective sample size are requested as convergence diagnostics as well as the trace plots for visual analysis. For comparisons of hazards, three HAZARDRATIO statements are specified—one for the variable Therapy, one for the variable Age, and one for the variable Cell. This analysis generates a posterior chain of 10,000 iterations after 2,000 iterations of burn-in, as depicted in Output 64.13.1. Output 64.13.2 displays the names of the parameters and their corresponding effects and categories. 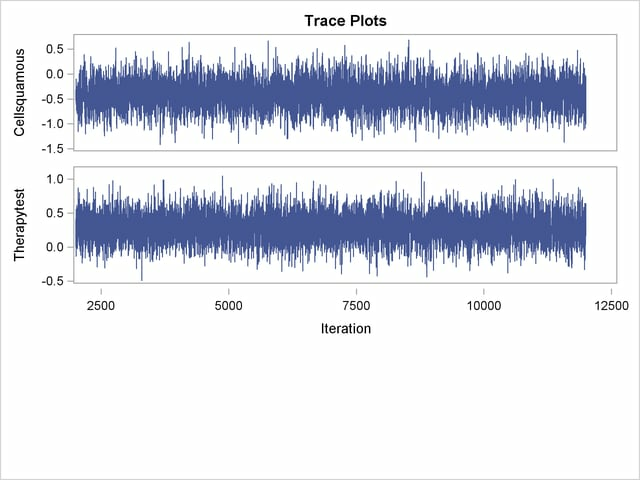 PROC PHREG computes the maximum likelihood estimates of regression parameters (Output 64.13.3). These estimates are used as the starting values for the simulation of posterior samples. Output 64.13.4 displays the independent normal prior for the analysis. Fit statistics are displayed in Output 64.13.5. These statistics are useful for variable selection. Summary statistics of the posterior samples are shown in Output 64.13.6 and Output 64.13.7. These results are quite comparable to the classical results based on maximizing the likelihood as shown in Output 64.13.3, since the prior distribution for the regression coefficients is relatively flat. With autocorrelations retreating quickly to 0 (Output 64.13.8) and large effective sample sizes (Output 64.13.9), both diagnostics indicate a reasonably good mixing of the Markov chain. 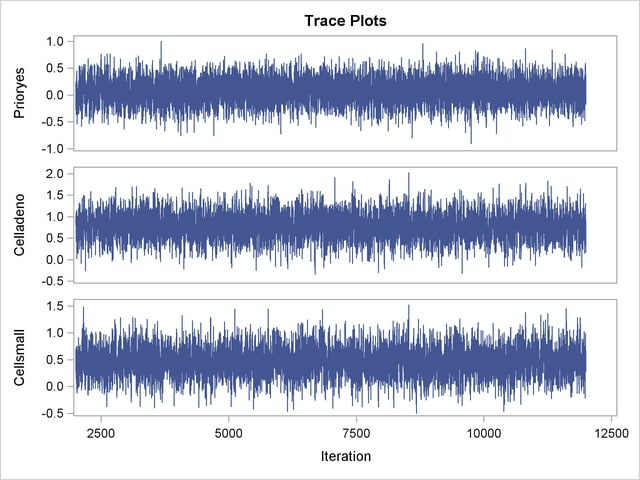 The trace plots in Output 64.13.10 also confirm the convergence of the Markov chain. The first HAZARDRATIO statement compares the hazards between the standard therapy and the test therapy. Summaries of the posterior distribution of the corresponding hazard ratio are shown in Output 64.13.11. There is a 95% chance that the hazard ratio of standard therapy versus test therapy lies between 0.5 and 1.1. The second HAZARDRATIO statement assesses the change of hazards for an increase in Age of 10 years. Summaries of the posterior distribution of the corresponding hazard ratio are shown in Output 64.13.12. The third HAZARDRATIO statement compares the changes of hazards between two types of cells. For four types of cells, there are six different pairs of cell comparisons. The results are shown in Output 64.13.13.